We are tantalizingly close to the north-eastern edge of the Lake District. In England, for spectacular scenery, the Lake District cannot be beaten, IMHO, not that I’ve seen everything, of course. In search of interesting attractions, Francine spotted an RSPB site on the shores of Haweswater, not too far distant. Our route could be encouraged to go through the village of Shap, which Francine also fancied seeing. We’d be needing shopping, too, on our way back and Penrith should be able to satisfy that. A plan emerged. The intriguing thing about the RSPB reserve at Haweswater is that it used to be home to England’s only breeding pair of Golden Eagles (Aquila chrysaetos). Unfortunately the male lost his mate a few years ago so it is now the home of England’s only Golden Eagle, who can apparently be seen displaying, at the right time of year, in an attempt to attract another passing female Golden Eagle. Very sad, really; I’d say the likelihood of that happening would be pretty slim given the paucity of Golden Eagles in England. We drove off and headed for Shap. Soon, we were threading our way down 1½ track country lanes overlooking fields criss-crossed by light-coloured dry stone walls enclosing various farmers’ herds of sheep. Unusually, the sun was shining and the scenery looked idyllic. Stopping to take this picture was a little problematic but we managed it without upsetting more than two of the aforementioned farmers in their Land Rovers. You really do need a serious four wheel drive up here in the winter, I’d imagine. 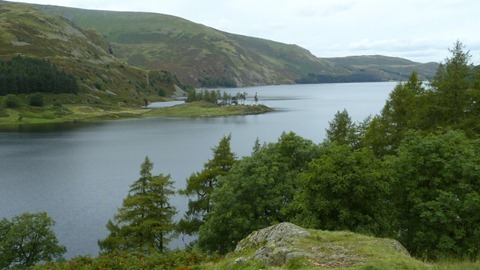 Haweswater is a man-made reservoir, i.e. dammed. I’d have thought that there were already enough lakes in the Lake District but apparently, in 1909 “they” disagreed, dammed a valley flooding a couple of compulsorily purchased villages, and created another, Haweswater. I bet the flooded locals were very happy. Hey ho! We drove the length of Haweswater to its southern tip where we found an overfull car park. Clearly other folks were interested in the walks and the lone English Golden Eagle, too. We found a small, as yet car-free pull-off and parked to begin our walk. To cut a long story short, we wandered three miles there and back with no sign of anything large, feathered and golden brown, lone or otherwise. In fact, we didn’t really see any birds other than swallows feeding on flies above the fields in preparation for their long flight back to Africa. Given this year’s appalling weather here, one has to wonder why they bothered to make the long flight to us in the first place. Of course, they weren’t to know, were they? Despite grey, featureless skies, Haweswater itself looked quite picturesque, though. Very unexpectedly given the conditions, we did spot something golden brown hunting on the wing, though it was considerably smaller. After a very determined Francine watched and waited for a while, it settled in the grass and posed for pictures. What didn’t we have? A decent camera! Francine managed it with snappy, though. 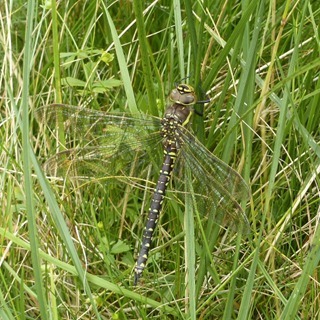 Our quarry was a female Aeshna juncea, known variously in the vernacular as Common Hawker/Moorland Hawker/Sedge Hawker. Whatever its name, it more than made up for our not seeing its much larger feathered raptor counterpart. As planned, on the way back we called into Penrith for some shopping. We’d last been here in 2002 on a Christmas trip to Pooley Bridge with our two ageing mothers. [The two ageing mothers are now even more aged.] Then we discovered an excellent grocery shop in the square. It was a timeless, double-fronted Victorian classic with a central island counter boasting a fine selection of cheeses, amongst other temptations. I was delighted to find that it was still there, largely unchanged. We entered and I made straight for the cheese selection. As usual, my eyes sought that which I didn’t know – something new. They were inexorably drawn towards a blue cheese labelled “Jervaulx”. I’d never before heard of Jervaulx and had to have some. As a lump was being cut, I was informed that this had originally been called Blue Wensleydale, had then been called Jervaulx, and the latest shipments were now coming in once again being called Blue Wensleydale. The Jervaux/Blue Wensleydale proved to be the best I’ve ever tasted. Delicious, whatever its name!